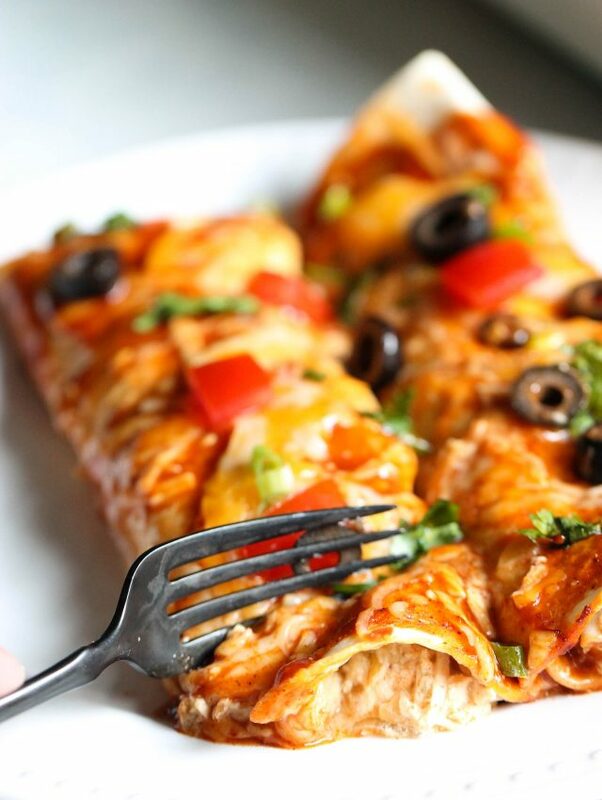 Make dinner simple - the flavorful filling for these Slow Cooker Chicken Enchiladas cooks all day in a crock pot. All you have to do is roll it up in a tortilla and bake these chicken enchiladas until the cheese melts. In our family, we absolutely LOVE enchiladas (we have over 20 different enchilada recipes on our site!). 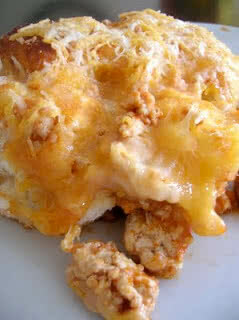 When you combine chicken and cheese together with a tortilla, it is a match made in heaven. 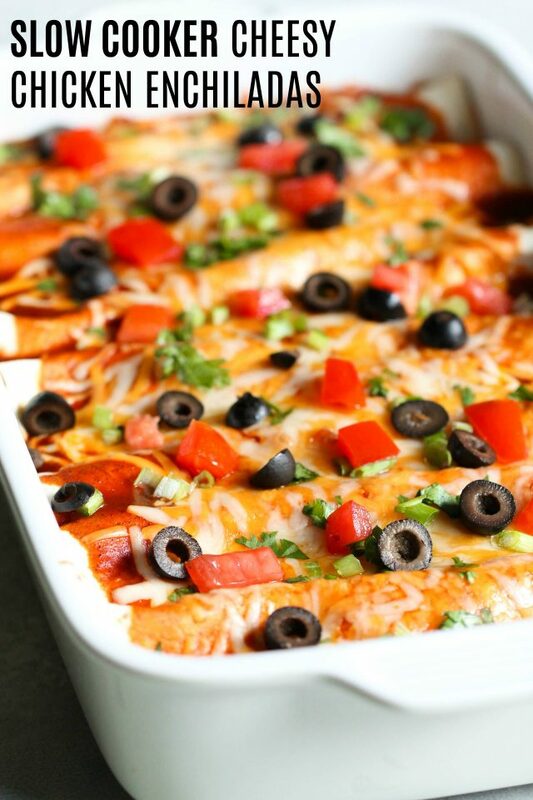 When it comes to making the perfect enchiladas, what kind of tortilla you use is a personal preference. Traditionally, corn tortillas are used in enchiladas, but flour tortillas will work just as well. In the picture, I used flour tortillas just because that is what my family prefers. We recommend using a 7-8″ tortilla for enchiladas because they seem to work best in a pan (we usually make about 8 enchiladas so that it fills an entire 9×13″ pan). If you do use a corn tortilla, it helps to place them in the microwave for a few seconds before trying to roll them into enchiladas so that they are more pliable and won’t rip as easily. I love to double this chicken enchiladas recipe and make two pans of enchiladas – one for dinner tonight and one to pop in the freezer for another night that’s busy. 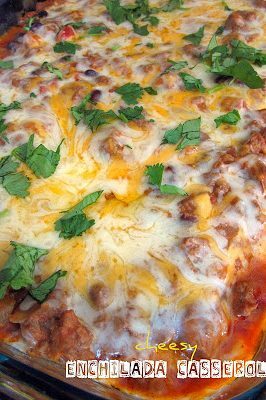 I will make these enchiladas in 2 separate 9×13″ pans and bake one for dinner, then wrap the other pan (I usually make one pan in a disposable aluminum pan) in aluminum foil and toss it in the freezer. 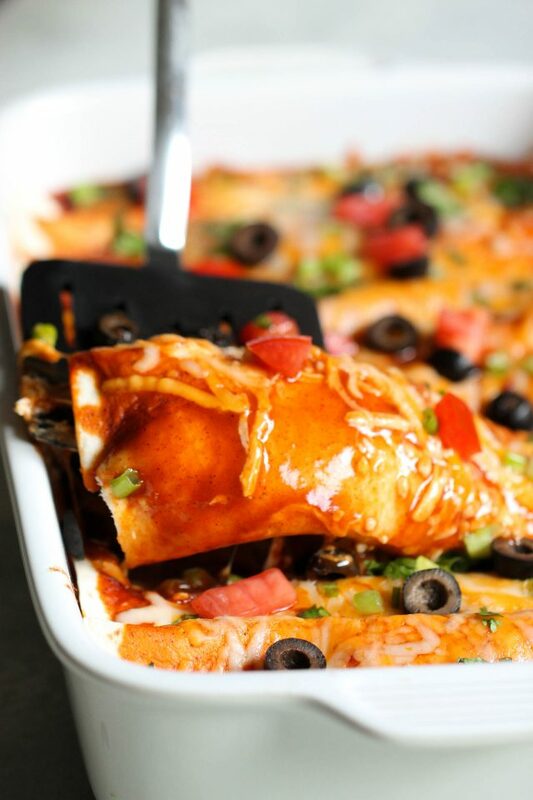 The chicken enchiladas will last for about 30 days in your freezer, so you can pull them out on a busy night and dinner is done! Depending on how well you package them, you could probably keep them in your freezer for up to three months. However, we stay pretty busy so we usually use them within the month. You could also freeze the chicken filling and then pull it out another day to easily assemble enchiladas. Can you cook frozen chicken breasts in the slow cooker? To be honest, almost every slow cooker chicken recipe that I make uses frozen chicken breasts. Some people will say that it’s not safe, but I honestly have never had a problem. I would recommend maybe adding a little bit of time to the cooking time, but it just depends on how quickly and how hot your slow cooker cooks food. Use this meat for anything! Or eat it as is! Spray slow cooker with non-stick cooking spray. Place chicken breasts inside slow cooker. Add taco seasoning, garlic powder, onion powder, chili powder, onion, green chilis, lime juice, and water on top of chicken. Cook on low for 6-8 hours or high for 3-4 hours. 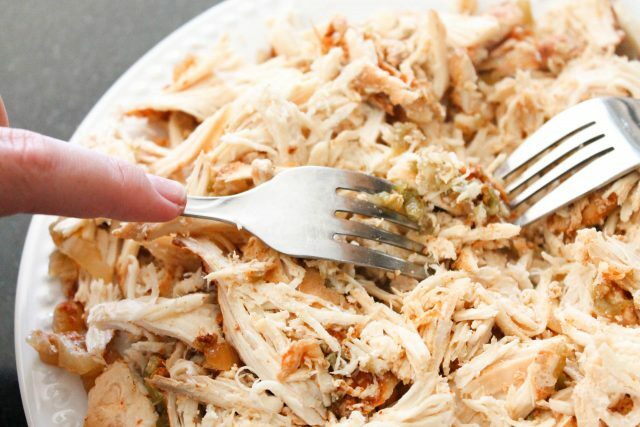 Once it is finished baking, shred chicken with 2 forks (it should come apart really easy). Mix together cream of chicken soup and sour cream. Stir half of the soup mixture in with the shredded chicken. Spread the other half of the soup mixture on the bottom of a 9x13 pan (or two 9x9" pans). 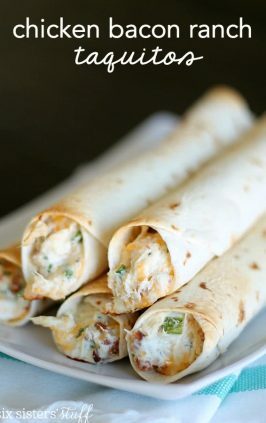 Place a scoop of the chicken mixture on a tortilla. Sprinkle on a little bit of cheese and roll up. Place seam-side down in the pan. Pour enchilada sauce over the top and cover with remaining cheese. Top with green onions and olives. In this video we are sharing how to make our 30 Minute Pantry Enchiladas! 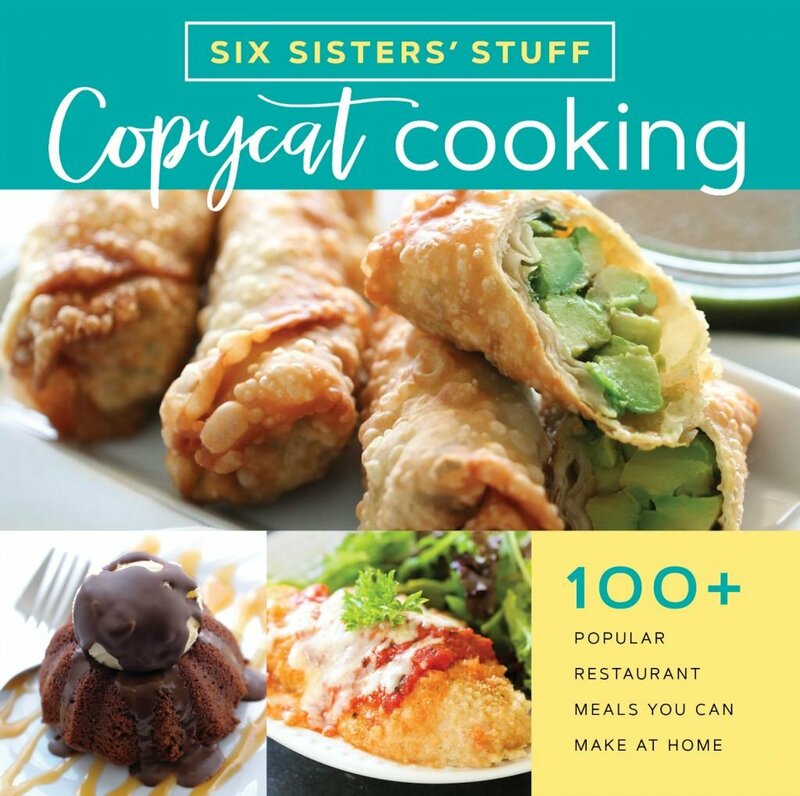 OMG - I have been pinning so many of ya'll's recipes lately - they look so good! Thanks so much! This looks so yummy, I can't wait to try it! I made this last night and it was a hit!! I had some avocados that needed to be used so I mashed up 1 1/2 of them and mixed it in with the sour cream and soup. I also used a green enchilada sauce. I also used mozzarella cheese because it's what I had on hand. Super yum!! Perfect timing! I was sitting down to do our meal plan and grocery list and doing the "what do I make!" run around in my head..then boom, this recipe to the rescue! Thanks! They look delicious! I am a HUGE lover of cooking in my slow cooker! And in the Summer time I try to use it at least 3 days a week! Thanks for sharing! Found this recipe on pinterest! Super yummy! do you use corn or flour tortillas? 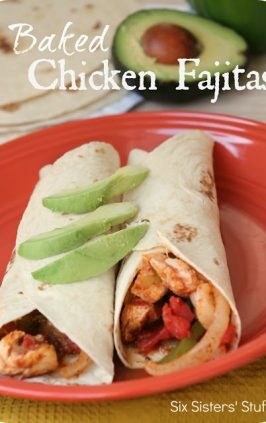 Typically they are made with corn tortillas, But I just read this recipe and I'm going to use flour tortillas. These were delicious! My husband is a big enchilada fan and he said they were the best he's ever had. I didn't have cream of chicken soup so I had to make some but I don't think that would have made a big difference. We had leftover meat and made quesadillas and that was really good too! Thanks for the recipe! I am new to cooking/freezing and am looking for recipes for home and to take when people are on marernity leave, etc. Could this recipe be frozen? If I doubled the recipe would the cook time change for the chicken? That would be a lot of chicken for one slow cooker. Do you have 2 crock pots you could use? That would work best. That should work fine. Just thaw and reheat. Just a tip, after simmering all day, just throw it in your standing mixer and use the paddle (if you have one).. shreds the chicken perfectly!!!!! Dumb question, but do you empty the contents of the cream of chicken as is or do you actually mix it with water like you're making the soup? Just dump in as is. After I shred the chicken, do I add it back to the water/chile/onion stuff it was cooked in? Or do I just discard that sauce? Making this today, my house smells so good! Thank you for this! If frozen (without thawing) how long and what temp to cook? can i use bone in chicken breast...if so how would that change the cooking time? 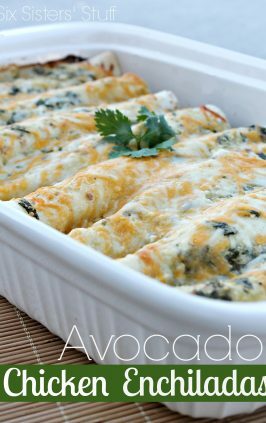 this is my go-to recipe and one that my boyfriend loves! i substitute the sour cream for greek yogurt (with every recipe - just as good and MUCH better for you) and omit the olives. wheat wraps, white wraps, spinach wraps - it doesn't matter! i have frozen the extra ones and reheated them and, honestly, its just not great, so really these are good for fridge leftovers. That being said, i do freeze the extra chicken mixture and reuse that in fresh tortillas! tonight I'm changing it up and using cream of mushroom soup, bc i don't have any cream o' chicken. nomnomnom! i have used boneless and bone-in breasts - bone-in is usually on sale! with the bone-in split breasts i remove them from the bone before putting them in the pot - i don't like to eat broken down marrow, haha. can't wait to eat them soon! Hi there! I know the recipe says 4-6 chicken breasts, but do you remember what the final weight was? I buy the bags of frozen breasts and the size varies so much. Thank you!!!! You just need to be able to fill 12 tortillas. Chicken breast do vary, even in the bag of frozen chicken breasts. If they all seem small, for sure go with 6. Would this work or have you tried this recipe in a instant pot? I just tried this in the IP last night. I put in frozen chicken breasts, mixed all of the seasonings together and sprinkled them on all of the chicken breasts, added the lime juice and put in 1 whole cup of water. I skipped the chilis because of my kids' tastes. Set it on manual for 12 minutes, and let it natural release for 5 minutes before releasing the pressure. Then I picked the recipe back up where you assemble the enchiladas. Turned out perfectly. Sounds delicious! When you make some for later, do you thaw it out and then bake it? or just throw it in to the oven frozen to reheat? and for how long? Cant wait to try! We thaw it first, then cook. I have a question: if I were going to make extra and then freeze, do I pour on sauce and everything as well? You can add everything as you would prepare it for the oven. Instead of baking, cover well and freeze.